Learning is complete and focused when it gives 360 degree analysis. Traditional classrooms and teaching fail to achieve this type of learning. Technology based lessons solves this problem to some extent. The major flaw in such designs is when the content is limited to more technical aspects rather than the actual consideration of a classroom. 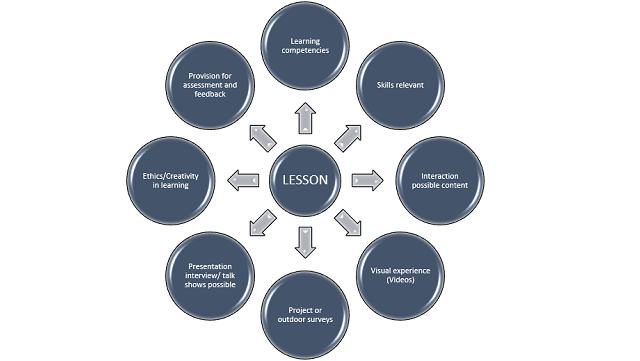 A typical classroom consists of different types of learners and learning experiences. Learners are dynamic and require challenging environment, which change often. Moreover, similarity in the flow of lessons, technically leads to boredom and neglect in the learning process. Delivery also becomes a routine for the teacher. Learning takes a back seat with the learner becoming passive. With a proper curriculum and set objectives design of such lesson can be done with simple technologies. Designing a lesson with technology may require involvement of multiple persons and it is time consuming as it moves from one department to another. This scenario can be rectified with the incorporation of Instructional designers, who can identify the essence of the lesson in the flavours required for its design. Teachers who are tech savvy and focus on wider aspects of learning are most suited for becoming instructional designers. This type of lesson development require less time and the focus is not specifically on delivery of the content but on the competencies to be developed. Based on the competency design for the lesson, assessment plan can be incorporated along with time management. Assessment strategy in classroom scenario should mainly focus on learning rather than learned. ‘Clickers’ or online forums are best suited for such work. Teacher can put forth a probing question which involves student participation as ideas online. The pros and cons of such idea collected can be discussed in a larger forum i.e., in the classroom. This gives the student to look at the question from multiple perspectives also a chance to understand others view point. Story development with lesson flow can also add interest to the lesson. Stories based on mythological, famous cartoons or movies can be opted for the same. Connectivity to the taught brings more interest and contact to the lesson. Ethical development among students has long remained a major issue with the use of technology. Case studies analysis, from anywhere in the world can be brought into the classroom through concepts involved in the lesson to collect feedback and allow students to ponder into issues safely. Examples of traffic congestion, natural calamities, deforestation etc., can be provided as live feed to classrooms to provide a touch of reality to the situations, which further develops sustainability among the future world citizens.